You are here: Home / Food, Water & Recipes / Benefits Of Bananas: Did You A Banana Is Good For This? Benefits Of Bananas: Did You A Banana Is Good For This? 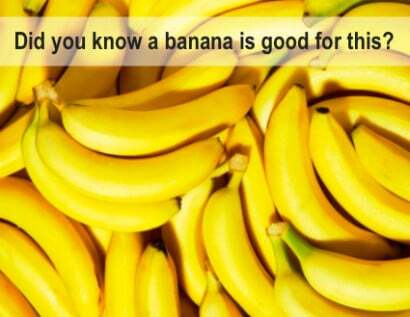 You probably know that bananas are an excellent source of potassium. You also probably know that bananas are a great energy booster before a workout. And we’d wager that you even know that bananas can be peeled from the bottom or the top, and that the inside of the skin can be wiped on out teeth to whiten them. But….we’re guessing that most don’t know that bananas are extremely helpful with these several common issues and ailments.